I have a new addiction. And I’m pleased to say that it is not NyQuil – though for a while there, that magical green liquid was in a tight race for second. But no, my new crush is something much more wholesome and liver-friendly. Puzzling. 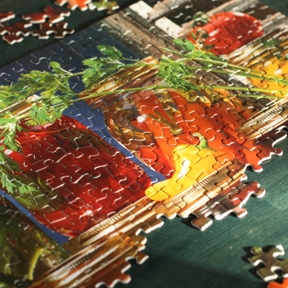 This isn’t a particularly new pastime for me – my husband Mark and I always tackle a jigsaw over the Christmas holiday, and sometimes we’ll break one out during a rainy stretch. But lately, I seem to be on a mad puzzling streak. True to form, Mark and I kicked off the season this year with a rather tricky Monster’s Inc. puzzle – an affair that involved way too much blue monster fur. Still, it was Mike and Sully and therefore hard to resist. Nevertheless, I handily packed it up to pass on, ready to reclaim our table. But then I surprised myself by pulling out another puzzle. And then another. And there is still one more waiting on the shelf. At first I thought it was just a way to pass the time while I was sick and under the weather. I’m still not running at 100 percent, but I’ve definitely turned the corner. Only my puzzling habit hasn’t let up accordingly. And now I’m starting to realize it for what it truly is – pure escapism. Ten minutes over coffee, extended lunch breaks here and there, and squandering away valuable kitchen time “just until I find that one piece.” Mark has even doled out a few mandatory puzzling sentences if I’m worked up or fretting about something. And let me tell you, it works! My Grandpa Milt was a puzzler. He often had a special card table set up to accommodate his 1000 piece forays. I’d eagerly sit down to help, but it was never too long before I lost interest. I remember wondering what the point was. But now, after all these years, I finally get it. The point is to sit down at your table and disappear into a world of colors and shapes and textures. I love running my hand over the completed sections and feeling the smooth cardboard beneath my fingertips. The beauty of puzzling is that it lets my brain shut off while still maintaing a nice level of concentration. That’s a good mix – and hard to come by sometimes. So I guess my addiction isn’t all bad, late dinners aside. But I should share how I kicked my NyQuil habit. After about my fourth or fifth dose I was eager to find a better and safer solution to the cough that had settled uncomfortably deep into my lungs. And so I tried a home remedy that has been scrawled in the back of one of my cookbooks for years. I was skeptical at first, so I made up just a quarter batch (I could care less about tossing out a little whiskey, but wasting a cup of honey – now that’s just foolish!) I took a few swigs of my concoction during an explosive coughing spell, and sure enough, I could almost instantly feel my lungs and chest easing up. Another shot before bed sent me straight to sleep. The next day I made a full recipe. I used raw honey, which simply means it has not been processed or heated. But I think any honey would have the same soothing effect. I also forewent the schnapps, but in retrospect, I think it would have been a lovely taste enhancer. I stored my syrup in a glass canning jar with a lid at room temperature. I’m sure it has a pretty decent storage life, but after a certain point, I think it would probably be better just to start fresh. Squeeze lemons into honey and add whiskey and peppermint schnapps. Stir until throughly mixed, shake if needed. 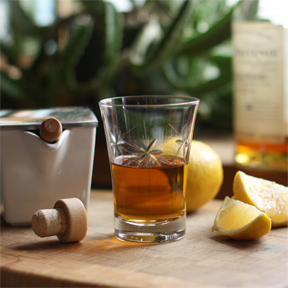 Sip until your coughing troubles leave (or you just don’t care anymore). Jill, if Grandpa Broeker let you help with his puzzles, you were truly in his good graces! He was most definitely a solo puzzler–none of this social, let’s everyone gather around the table business for him. I used to occasionally move a few pieces around when he wasn’t looking, just to see if he would catch me. He always knew his puzzle had been tampered with. Jigsaws were a Christmas holiday thing with him. The rest of the year, he would often sit in the living room and work a crossword before bed. Well, I do think he mellowed a bit in later years! Mostly I remember the Florida puzzles. But, like him, I know if my puzzle has been tampered with – and usually I can blame a cat. And in honor of your Grandpa Swenson I think you should definitely add the Peppermint Schnapps. Growing up there was no drinking in our house with one exception,. He kept a bottle of Peppermint Schnapps hidden in a high cabinet – brought down only when he had a cough. No honey, just straight Schnapps! It’s 24 pages Jill. Yikes. Can I print it out without the photos and read it at my leisure, on my couch? Hi Ella! I’m not sure – I think you’re probably the only one WANTS to print the whole thing :-) Otherwise, it’s not going anywhere, so you can just read it and/or print it bit by bit.